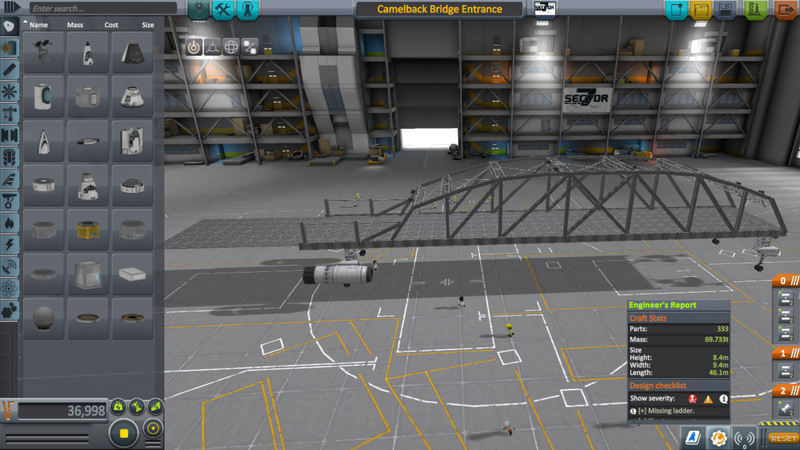 There are so many things I’ve been wanting to get done in KSP and a Camelback Bridge is one of them. These type bridges are so fascinating, the engineering involved is so amazing it often baffles me. I have always admired the structural strength and designs of bridges and the feature that seems to impress me most is their impressive look. For those interested I found a book titled How To Read Bridges A crash course in engineering and architecture at the local book store, if you like bridges you will like this book, keep in mind it’s a small paperback book but fulll of good information Bridges. This project I have to say has been the most trying of all, let me just say I’ve had many rounds with the Kraken. I started this Bridge with only a small section and it was planned to be just a show piece and had no intentions of it growing so big. Then the idea came to me about putting it over water. I built a Bridge Construction Set before and thought maybe I could bridge a gap somwhere on Kerbin. One thing lead to another and I found myself needing other craft to make this happen (in this case did not happen). I was hoping this would have been a more majestic looking bridge over water crossing to a small island but the Kraken would not allow that! I do plan to give it another try in the future and with a much stronger structure. I did want to give everyone a view of this 423.3 meter bridge that took literally months to build and over 200 hours of building testing even with the Kraken destroying and even once ate my entire 423.3 meter bridge leaving zero crumbs on the water, but I did manage to take a ride to it’s unconnected end for your veiwing. Lets just say Bridges are not recommended in a KSP yet…if ever….not sure what Squad will have for the future of this spectacular game. Bridges are lots of fun but not withstanding the physics of the game. Special Note: It is not recommended to build Bridges in KSP, I do this because I enjoy building stuff in KSP if it works or don’t work. The Mobile Bridge is not going to work when setting a Bridge over the Pool, the Bridge was modified for the Video. Also Bridges that are constructed will require a low profile vehicle, the Convertible Jeep only works with the Mobile Bridges, if you use it on a constructed Bridge do not use a Kerbal, cross the Bridge by Remote Control as seen in the Video. A stock aircraft called Camelback Bridge Entrance. Built with 333 of the finest parts, its root part is probeCoreOcto2.